Wow, this is surreal. 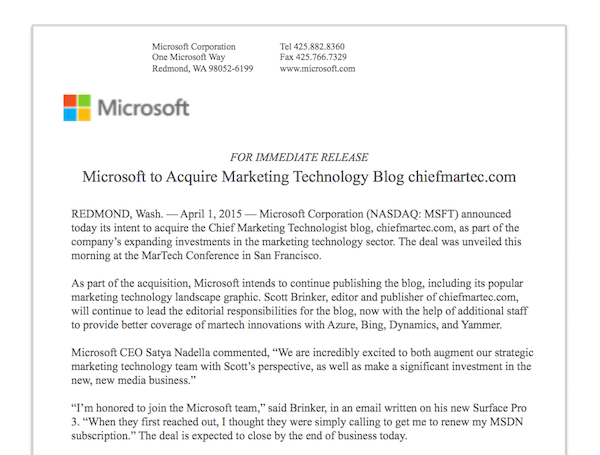 I’m trilled to announce that, yes, Microsoft has acquired chiefmartec.com, as of this morning. I shared the good news with the attendees at the MarTech Conference just moments ago. Some of you may remember a blog post I wrote last November on what will happen with marketing technology in 2015? 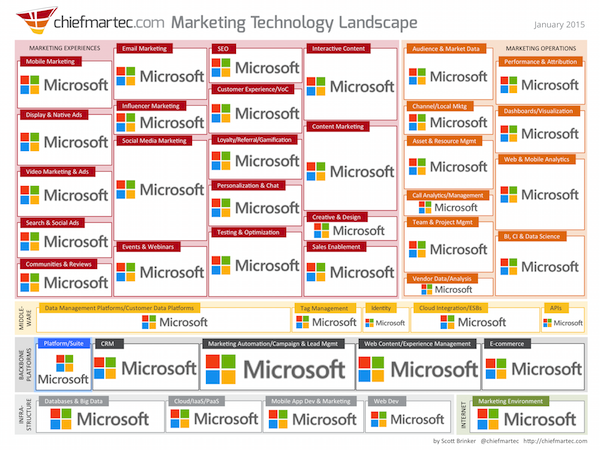 I made the bold prediction that Microsoft would make one or more major acquisitions in the marketing technology space this year, spending more than $1 billion in M&A. However, I never expected that to include my humble, little blog. While I’ve been asked not to disclose the acquisition price of my blog, I will note that they still have quite a bit of that $1 billion left for other acquisitions. I also scored an Xbox One and a new Surface Pro 3 as a signing bonus. I’m joking, of course. We’re not going to reduce the landscape down to a single vendor. At least that’s what I was told before signing the letter of intent. 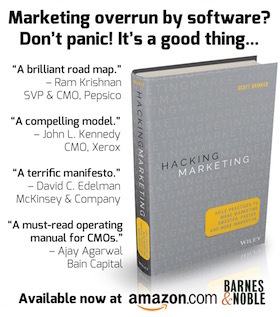 640 marketing technology companies ought to be enough for anybody. Technology blog investments are pretty much a no-lose proposition. In my experience, the acquisition of tech blogs by major corporations always leads to harmonious outcomes. This breakthrough deal significantly consolidates our LUMAscape of tech logo landscapes. This deal is expected to close by end of today, April 1. Congratulations! I’ve followed your blog for a while and knew you were on to something. This confirms that we were both right! Darn it!!! I almost went the whole day without falling for anything. Awesome that April brings the news that humble blogs can now be billion dollar acquisition targets (approx)! I also appreciate that the landscape map is now so much simpler and maybe we can remove the blown up previous version we use to carpet the office just so we could see where we might possibly want to be! Congrats. Brilliant!!! Can’t wait to see the consolidated LUMAscape of tech logo landscapes. Too good. You are supposed to fool some people some of the time :). Congrats! And all the best for the future! You know, it’s not a bad idea. Adobe is to CMO.com as is to MarTech. I could see you buying your own private island by the end of the year.